It is an accepted truism that when journalists predict an election, they are usually wrong. And when all journalists call it the same way, exactly the opposite result is guaranteed. Opinion polls are dodgy too, but better than us journalists. So, what happens when all of them agree on the same broad outcome? This has been a week of several opinion polls. One thing they fully agree on is that if elections were held today, we are guaranteed a hung Parliament, with the BJP as the largest party, the Congress as the next but with just half its size, and a genuine coalition government once again. There are still three months to the elections and nothing in politics remains static. We can, however, track some significant trends and safely draw the following broad conclusions from these polls. Which one is good or bad, I leave to you to judge based on your own voting preferences. 1) The most striking indicator is that while the BJP will fall far short of its 2014 majority, Prime Minister Narendra Modi’s personal popularity is by and large intact. The India Today poll shows the BJP vote share falling just one per cent from 31 in 2014. This is remarkable. I believe that while there is significant disillusionment among his original voters, it is compensated by the unquestioning devotion of the close to 13 crore first-time Lok Sabha voters, born generally 1996 onwards. The difference between them and the rest is they haven’t been out in the job market yet. As I have noted during my travels through state elections, they are still dazzled by Modi’s power and charisma, believe the propaganda on his schemes, from Swachh Bharat, Skill India, and the war on corruption to India’s “rising” global profile. They haven’t been exposed to a counter-story yet, or to the hopelessness of unemployment. It’s the great hedge holding Modi/BJP back at the edge of the cliff. 2) The political mood isn’t so much about the current reality, as the momentum. If you plot the numbers of each poll from what was Modi’s peak in post-demonetisation January 2017, when India Today gave the BJP 305 and the NDA 360 seats, the momentum is downhill. It isn’t hurtling down, but isn’t too gradual either, a “loss” of one-third in two years. If it continues that way, the BJP number could logically fall by another 25-40. Can Modi stall, or even reverse this momentum? Visualise Indian public opinion, with all its diversity and complexity, like a juggernaut: Massive, primitively engineered, creaking. It takes masses of people to make it move slowly. But once it is cranked, it is tough to reverse. Remember, momentum is mass multiplied by velocity. Reversing it is near-impossible, and Modi knows it. That is why the flurry of radical, improbable populist actions, from reservations for upper castes, quotas for all in private institutions, to a last-minute avalanche of CBI raids on the “corrupt and the powerful”, and whatever next week brings, with the Budget etc. Modi and Amit Shah know any tally below 180 is curtains. If they can change the direction of this juggernaut in the next 100 days, it will be a most remarkable feat. So, fully expect more desperate and radical announcements in the coming days. Remember again, their bulwark will still be the 13 crore first-time voters, with their still-uncluttered minds. 3) If you take out Uttar Pradesh and the SP-BSP gathbandhan there, it is remarkable how the BJP’s numbers in the rest of India are about the same as before. Various polls show the BJP losing 45-55 seats in UP. That’s precisely what it’s losing in its overall 282 tally. It seems to be holding sway, if not a clean sweep, in Madhya Pradesh, Rajasthan and Gujarat despite the recent assembly elections setbacks. Some losses in the north will be compensated in the east and northeast. UP, therefore, is the one factor keeping it away from a majority. Can it find a trick to counter that? Something of such sentimental appeal that it consolidates the Hindu vote, cutting through caste. 4) The Congress is reviving. In terms of percentage over the base, its gains are much bigger than the BJP’s losses. Difference is, its base is low. So even a 200 per cent increase would keep it to under 140. Current opinion polls put it just over 100. Even if you extrapolate these most generously, presuming that Modi is not able to reverse the momentum, you do not see a spectacular surge. Its best hope lies in denying Modi more of the seats in the three heartland states it has just won. The key number for it is 150. Either take its own tally there, or keep Modi below it. A third way would be to widen the UPA tent and persuade more regional or caste-based parties to come under it. All three look improbable at this point. But a second pole is back in Indian politics. 5) In the previous week’s National Interest, we had talked about the third, and our notional fourth and fifth fronts. If about 150 seats go to leaders not aligned to either the Congress or the BJP, many will hope to become prime minister in a grand compromise. It is highly improbable. None of the parties other than the BJP and the Congress can reach 50, in fact even 40. The only way such a grand-bargain fantasy would come true is if the Congress and the BJP together are somehow kept below 272. That has never happened and is most unlikely this May. 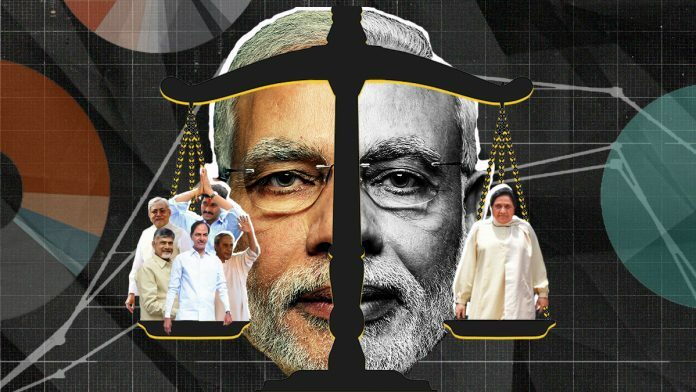 But anyone with 15 seats or more will have the power to strike other big bargains, from getting certificates of good conduct from the CBI and the ED on the Ballari Brothers’ pattern, special packages for their states and key portfolios. Final alliances depend as much on who you cannot go with as on who you can. We know that the Left and the SP can never go with the NDA, just as the Akalis and the Shiv Sena won’t with the UPA. Now look at those who’ve been flexible in the past. Mamata has been with both coalitions, but her current dominance in Bengal rules out her return to the NDA. There are others in the 15-plus category who will have options open: DMK/AIADMK, Naveen Patnaik, Chandrababu Naidu, Telangana’s KCR, Jagan Mohan Reddy’s YSRCP and, for heaven’s sake, the sharpest of all, Nitish Kumar. About 100 seats will be shared among these non-ideological parties who will likely go with the winner. 6) This is where we return to Mayawati. If Modi is denied a second term, it will be primarily because of the unique power she commands in our politics: A transferable vote. She has happily bonded with the BJP in the past. She is fully non-ideological in Left-Right terms. If anti-Manuwaad is her only ideology, the NDA and the UPA are equally evil and she can drink that poison from either chalice. Modi and Shah know that the key-card to their second term sits in her fancy handbag. She is the one plank they want to pull away from their rivals, through charm, threat or both, before the elections or after. Unlikely, but you can never rule that out, even if it means the hatchet being buried later in Yogi Adityanath’s back. To sum up: Modi’s personal popularity and vote bank is mostly intact, but momentum is negative, the UP alliance is all that threatens his second term, the Congress is rising but not enough, any party with 15 or more MPs will be a kingmaker but not the king, 100 seats will go to parties that can go with any winner. And keep a close watch on Mayawati. A well balanced and logical analysis.Let us wait and see. I am surprised that there is no mention of Maharashtra & Delhi. 1) NDA won 43/48 in Maha in 2014, a bunch of these were seats even they didn’t expect, but won because of the Modi wave. The continued mismanagement of agri sector by state & reluctance of center has seriously alienated the rural masses. While Shivsena has also lost credibility, the NCP-Cong alliance remains as strong as it was, even attracting smaller players like Raju Shetty to it. I will be surprised if NDA crosses 25 in Maharashtara this time. 2) In 2014, AAP was seen as impatient and arrogant after the 49 day government. BJP won 7/7 there. This time, AAP goes in with a lot of results to show on the ground as against BJP’s lies. Expect not more than 2 seats in Delhi. 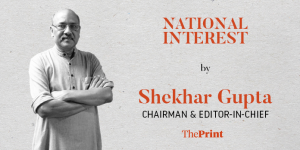 Mr. Shekhar Gupta, no doubt you have a rich and vast experience in political and election analytical studies ! But something very startling and unexpected seems to be in the offing ! a ” BLACK HORSE” ! Mr Gupta should openly say that he is anti modi and pro congress. Why does he shy away from admitting this. Being head of egitots guild or guilt, he should show some responsible behaviour. Will tweet, write on anything and everything about this govt in negative way but acts as an ostrich when actually such things are happening in Congress ruled states. Haven’t seen him once comment on loan waiver in Congress states or 10000/- promised to all unemployed by Bath in MP or political murders in WB. With the position you hold, because of whose largesse I am not aware, do some justice to the chair u occupy and stop being of such negative mentality and anti national. You may have no respect left of you but at least give respect to chair u hold. I do not agree with the premise that the first-time voters are pro-Modi. Youngsters have an “independent” mind, that’s true, but they don’t have a “disconnected” mind. They are young themselves for sure, but they live in homes where there are middle aged people who don’t speak very approvingly of Modi and his party. The youngsters are also not immune to the talks they hear all around them about how DeMonetization has upset the apple cart etc. When we talk of first time voters we talk of men who have crossed the age of 21 and women of 18. These are not exactly young ages; at this age people do start worrying about their jobs, their availability or otherwise. So it would be incorrect to say that the first timers will vote as one block and in favor of Mr Modi. Lord Ram and Lord Krishna both taking earthly form are required to save Uttar Pradesh. One state itself could cost half a hundred seats. 2. R / M / C have 65 seats, with the Congress holding about three. That should go to at least thirty. 2 in Maharashtra will go to about a dozen, possibly more. Karnataka, Delhi, Punjab, Haryana, the small two hill states, almost everywhere the party will gain. A band of 120 to 140 is possible. Especially if friends and partners in UP and Bihar give it its due. 3. If popularity ratings were holding up, the snowmelt in seats would not be taking place. Already the threshold of acceptability has been lowered from 240 to 180. If the shortfall is a hundred seats, not only will allies like the Shiv Sena demand a veto, many within the party will start get ideas. I fully agree with Mr. Abhijit. Most of the so-called liberal journalist uncritically enough have borrowed euphemisms used by the opposition while describing BJP in general and Modi Government’s schemes and projects in particular. Ujjawala scheme, Jan Dhan Yojna never got their due publicity. It is not surprising that BJP all the time was categorically as ‘communal’ – not even ‘so-called’ communal. But SP and BSP were never casteist – they were doing ‘social engineering’. Then UP CM Mulayam Singh’s rallies were described by the journalists of all hues as ‘mammoth’. Having been from a heartland village of UP, I knew that something is wrong there. And then it came out that Mr. Yadav had obliged the journalist by allotting them free apartments in Lucknow ! Mr. Gupta needs to remember the quote attributed to Voltaire: ‘The adjective is the enemy of the noun’. I am saddened that an erudite journalist calls Swachh Bharat scheme a propaganda. Could Mr Gupta have not said it is a responsibility of society, Modi and government can at best work as a catalyst? Those who claim that Indian image outside has not improved, live by burying their head in sand. Modi has certainly tried build a bridge of friendship with different countries without being preachy. Internationally every country works to fulfill her national interest, as it should be, but friendship bond does not hurt. I have not seen Manmohan Singh Ji do it. Unemployment is a problem. With burgeoning population and advent of technology, jobs scenario will remain complicated for years to come. Modi had tried to initiate a culture where people try to be a job giver and not job seeker. Yes it takes time to alter mindset. Same problem of joblessness was there even in high growth UPA era. Only problem was growth was fuelled by corruption and cronyism. Criticizing government is job of journalists. But add some dose of healthy criticism also in the soup. You will not dispute the fact that ‘momentum is negative’. You don’t need journalists and opinion polls to report it, you feel it. You feel it in the streets, offices and homes. You think it should not have happened because Modi is doing a good job, and if he has failed somewhere it is because of forces beyond his control. In my opinion, it is not his individual acts of omission and commission that is pushing the momentum negative. It is his persona. And the reality of his party that has come through in the last five years. The experience is distasteful to the Indian psyche. During the last elections there was a mask. Reality got uncovered in five years. Another mask can be readied for 2024 in the intervening five years. But for now the negative momentum will swallow Modi and his party.